I’m a photographer based in Tokyo. I collect film Canon SLRs too, though my current bag setup is not built around showing off my cameras! 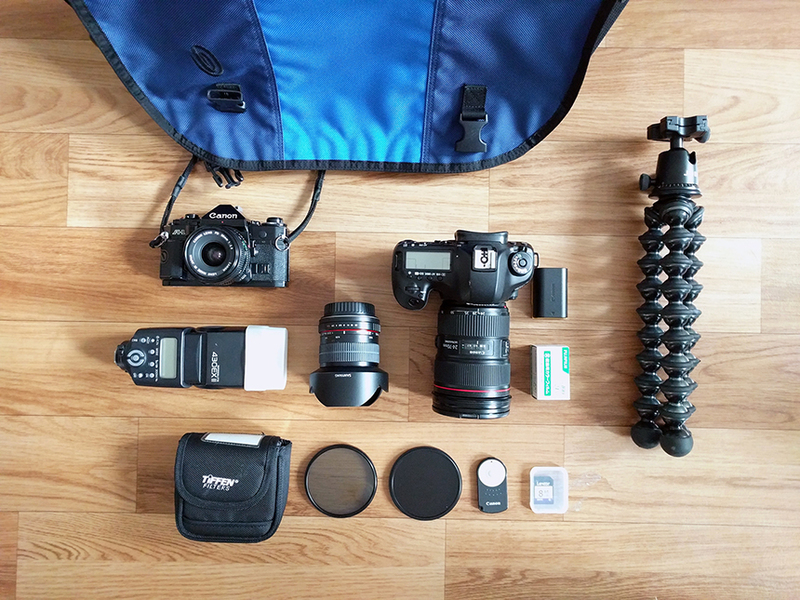 The key components are a Canon 5D Mark III and the Canon A-1, with a Samyang 14mm wide angle lens. I’m chiefly a landscape photographer stuck in an hyper-urban jungle, so I make do with my 24-70 II whenever possible, and switch out my Samyang when I have no hope of using it during the day. My A-1 is really for the moments I have to compose carefully, but the 28 f/2.8 on it has surprised me with really beautiful bokeh. 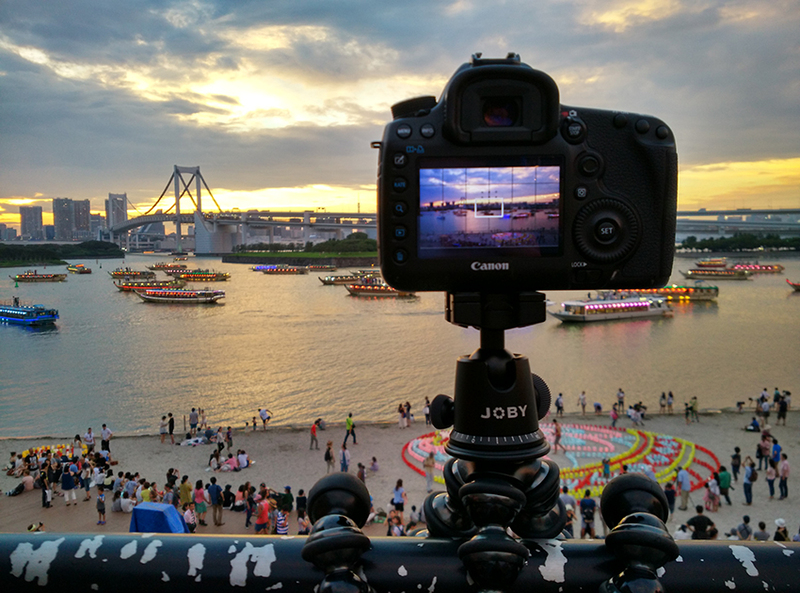 The Gorillapod Focus and ballhead was expensive but it has definitely outdone itself many times, and is particularly nice in Japan where lots of places people take photos from explicitly prohibit the use of traditional tripods. It mounts nicely against railings and gates, and sets up within seconds. When I shoot video I bend the legs all towards one side so that I can rest it against my chest for extra stability. I carry a couple of filters (CPL and one ND8), an extra SD card and a remote, which all sits nicely in a Tiffen lens pouch. I like this particular one because it has a Velcro attachment at the back so that I can wrap it around my bag’s strap when I need it within reach. The 430 EXII has never failed me (yet) and I’m always surprised at the moments where flash has improved my shots, so I always keep it with me. Spare battery and an extra roll of film keeps me well prepared. Lastly, this all fits nicely into a Timbuk2 bag with the camera padded insert. I have a sort of love-hate relationship with this bag, though. On the one hand it really doesn’t look like a camera bag and it fits everything really nicely — even when I end up switching the Samyang for a 70-200, for example. On the other hand, having most of the weight of this equipment on one shoulder really doesn’t do wonders to your back. So recently I’ve tried using a Thule camera backpack and another Timbuk2 backpack, but the former is a bit too large (its great for an overnight trip, together with a better tripod) and the latter doesn’t have padding. So overall I’m happy with my current setup. This entry was posted on Sunday, January 3rd, 2016 at 10:19 am, EST under the category of Photography. You can leave a response, or trackback from your own site.